in Bridgeport, Conn., on Friday Feb. 15, 2019. 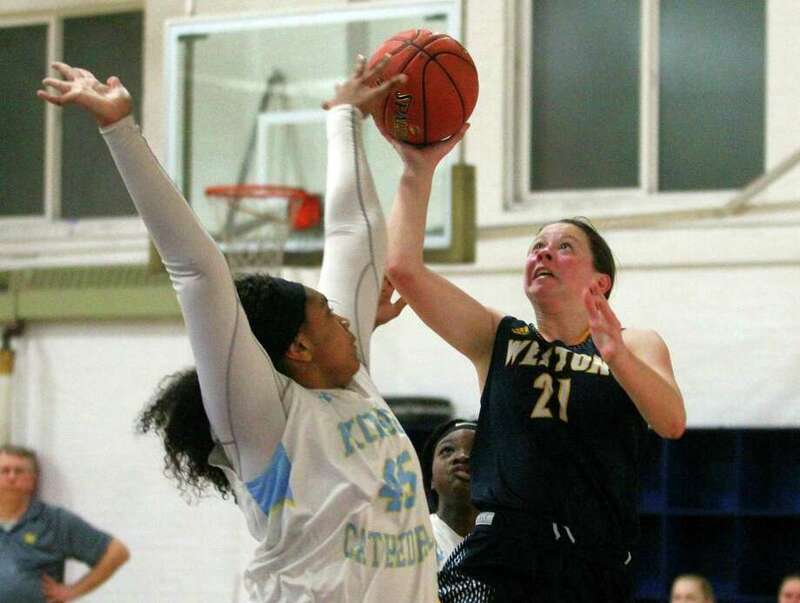 BRIDGEPORT — Gracen Kerr scored a game-high 16 points to lead Kolbe Cathedral over Weston, 53-27, in the quarterfinals of the SWC girls basketball tournament Friday night at the Shehan Center. Brianna Meekins added 12 points for the third-seeded Cougars (18-3), who will play at second-seeded Newtown in the semifinals on Monday at 7. Kate Joyce scored 10 points in the loss for the Trojans (12-9). Shea Greene 2 0-0 6 Bridget Angus 1 4-6 6 Emily Melito 0 2-3 2 Kenna Winslow 1 1-2 3 Kate Joyce 2 6-8 10. Totals: 6 13-19 27. Brianna Davis 1 0-0 2 Beatriz Honorio 1 0-0 2 Gracen Kerr 5 4-6 16 Aniyah Pettway 2 2-4 7 Trinity Stackhouse 2 1-2 5 Robin Selitte 1 0-0 2 Brianna Meekins 5 2-5 12. Totals: 17 9-17 53. 3-pointers: W—Greene 2; KC—Kerr 2, Pettway. Holly Fleming 1 0-0 2 Clare McGrade 0 0-1 0 Ariana Mamudi 0 0-0 0 Faith Kanych 6 3-4 19 Mackenzie Sam 0 0-0 0 Olivia Davidson 0 0-0 0 Stesha Grossman 0 0-1 0 Courtney Delehanty 0 0-0 0 Jenna Joshi 3 3-4 11 Victoria Araujo 0 0-0 0. Totals: 10 6-9 36. Ciara Brown 5 4-5 14 Yamani McCullough 2 0-0 4 Aizhanique Mayo 4 1-2 10 Laryssa Guimaraes 5 0-0 10 Krystalee Fernandez 3 0-0 7 Kayla Tilus 1 1-2 3 Taylor Gibbs 2 0-0 4 Brianna Perez 0 0-3 0 Corinn Ouellette 1 0-0 2. Totals: 23 6-9 54. 3-pointers: B—Kanych 4, Joshi 2; NDF—Mayo, Fernandez. Addison Marchese had 12 points to lead the Warriors (10-11) to their win in the opening round of the Shoreline Conference tournament in Deep River. Kelly Donlan led the Knights (9-12) with six points. Westbrook’s Savannah Marshall missed the game due to a shoulder injury. Valley will face Cromwell in the quarterfinals at Cromwell, Saturday, 7 p.m.
Addison Marchese 2 2 2-2 12, Alena Crosby 1 0 1-2 3, Heather Jones 1 0 0-0 2, Annie Cooper 0 0 2-2 2, Reagan Brenneman 2 0 1-2 5, Libby Cap 2 0 0-2 4, Ava Cunningham 0 1 0-0 3, Elizabeth Klomp 0 1 0-0 3, Salmi Miller 1 0 2-2 4, Campbell Toth 2 0 1-2 5.